The elements that contribute to an effective web design, although subjective in nature, have been tried and tested, repeatedly. Whether for an ecommerce website or a local business website, the best practices of web design center on a consistent layout with cohesive typography, color schemes, and overall usability. Not only does logical use of these elements make a site look better, but they can also impact conversion rate potential, which is a big +1 for SEO. The foundation to any online business is its website. 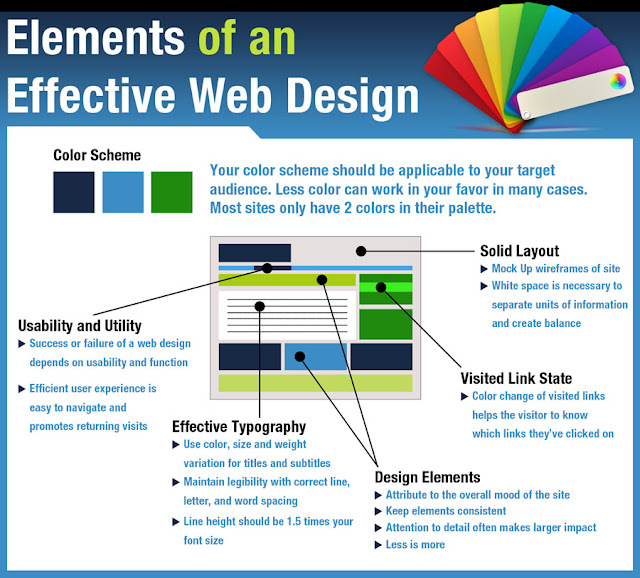 Ensure the elements of your company's web design are cohesive and conversion-effective by absorbing our infographic below. Cheers. The first thing that a visitor looking in a site is the color, then the design. So if a site has an awkward mix of color, the visitor will probably leave it and might never back again. That's why it's important to have a great taste of color mixing in making or building a website in able to make it interactive and eye catchy! Great infographic! Designing a flow of your content is really important if you want to attain the highest usability, functionality and, at the same time, conversion. Your design should agree to the content being presented, thus allowing harmony between them. Also, the design should make it clear to the visitors what they should do after they consume the information presented. Thus, call-to-actions should be very obvious and are to be placed in prominent parts of the page. A solid layout is essential to make a web design stand out and catchy. The seo companies that I worked for has taught me well enough on how I could make an attractive websites but the information you shared here are quite impressive. I'll inform my boss about these additional tips! Creating a website is like painting a masterpiece on canvas. You have to get everything in just the right proportions and not let anything overpower the site too much. Every professional search engine optimisation services provider will agree with that. I am an amateur web designer in Perth and I am currently looking for more ways to improve my skills. I will take note of your tips and put it into practice soon. A good website must contain proper design aesthetics and good and readable letters. Some people want the fonts a little bigger than usual while some loves it a little smaller. For the basic instruction about creating a seo friendly web design, I always use my handy seo book. The picture that you’ve provided briefly explains all the necessary information that we must include when we create a website. Amazing. Thanks. Just do it now. Good info as well as good tips most especially to the web designers. Thanks. Some designers fail to consider the Effective Typography. Thanks for the photo, I'd be glad to print it and post on our bulletin board. Thanks! I have the benefit of reading your blog post for the reason that I am developing a website for a very special client. Now I am very confident that I can satisfy my client by the time that I launch his website.